First, produce consistently. Like we said, the social world never stops moving and if you want to have a chance at your company being noticed, you have to be posting to your social media channels several times a day, possibly several times an hour. Think of it as being “appropriately obnoxious.” Or maybe just relentlessly tenacious. Second, produce quality content. Yes, you need to make sure that you are out there A LOT, but that doesn’t mean just throwing any old thing up as your post. You need to make sure that you are posting relevant, quality, engaging content that will make people want to see what you’re saying and see more of it in the future. The good news is, it doesn’t all have to be 100% original. Sharing relevant content from other trusted sources can be just as beneficial as sharing your own stuff. It can help set you up as a trusted source and leader in that subject matter. 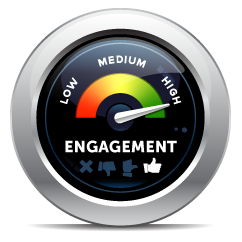 Remember to engage- It’s important to focus on engaging with your social media followers, even if you don’t have as many as you’d like to start off with. An engaged fan base will grow itself, while an unengaged one will not grow at all. It is also important to remember to interact with your fans in a timely manner. Ignoring follower’s interaction is a good way to lose them quickly. Remember the social aspect of social media. Try new things- there are always new social media platforms being introduced and sometimes being on the forefront of the latest site can be a big break for your company. There are the tried and true basics like Facebook and Twitter but don’t be afraid to try other platforms and new ones when you hear about them. They may work even better for your company. Remain consistent with your brand- While you’re trying new platforms and strategies, never forget what your brand is all about. It’s important to remain as consistent as you can across all aspects of your marketing, and that includes social media. Changing your voice can lead to confusion and frustration in your followers. Consistent branding is an important part of keeping an engaged audience. Remember to measure, but also have fun- Measuring your results is very important, and should not be forgotten. But it should not be the driving force behind your social media strategy either. A designated number of likes or fans on a page or post aren’t going to be as lucrative for your company as a smaller, more engaged audience would be. Focusing solely on the numbers and the data can squelch the room for creativity. In a world where you have to be more and more creative to be noticed, that can be deadly. So remember, numbers are important and you should pay attention to them, just remember they aren’t the answer to everything. Consider hiring a PR firm- Social media is constantly evolving, so staying on top of the latest trends and platforms can be exhausting! Why not leave it to the professionals? It’s their job to know the latest ins and outs, so let them keep track of your social media for you. We’d love to see how we can make your user engagement work for you. Social media can be a hard beast to conquer, especially for someone who is just starting out in the social sphere, but don’t let that stop you. Use these tips to help build an engaged social audience who will be loyal to your company. You’ll see how it pays off in the end. Relationships are more beneficial than causal acquaintances. Contact us for a free quote how we can better manage your social media today.